Food Allergy Canada has released a book for teens that I fully endorse. It’s titled “The Ultimate Guidebook for Teens with Food Allergies” and contains 21 chapters of insightful tips, stories and advice from teens. It’s not a “preachy” book at all – it simply delivers information that teens can relate to and learn from before they encounter tricky situations themselves. A physical book is available through Amazon, or download the eBook for just over a buck. I first met Becca from Red Plate Foods at the Portland FARE walk in August. I remember it like it was yesterday, as that was the day I ate the BEST cupcake of my life! (With an nut + egg allergy, this is a big deal!) Becca offered my wife (gluten-free) and I both a sample cupcake as we left the event. We ate them while driving away, and after only a few bites, started giving each other those wide-eyed “this is incredible” looks, and the “Mmmmm’ing” out loud sounds! We realized we hit baked allergy-friendly gold! Fast-forward to October when I was back in Portland to perform at local schools. Sure enough, I ran into Becca again! This time, more samples….cookies, cupcakes and muffins. ALL were simply amazing. I offered a few cookies to a family I was staying with, and they looked at me like I was handing over the keys to a Porche! They TOO knew of Red Plate Foods and were giddy about receiving the samples! After performing at schools across North America for 6 years, I have decided to bring in sponsors to the mix. I am still a fully independent musician and educator and will never include any advertising of any kind in a school setting. The messaging that I provide to students about food allergies has always been, and will always be pure without any type of hidden agenda. On a side note – one guy once accused me of being the Bob Dylan of the allergy world and that I was trying to influence legislation in British Parliament through music! Ummm Nope! 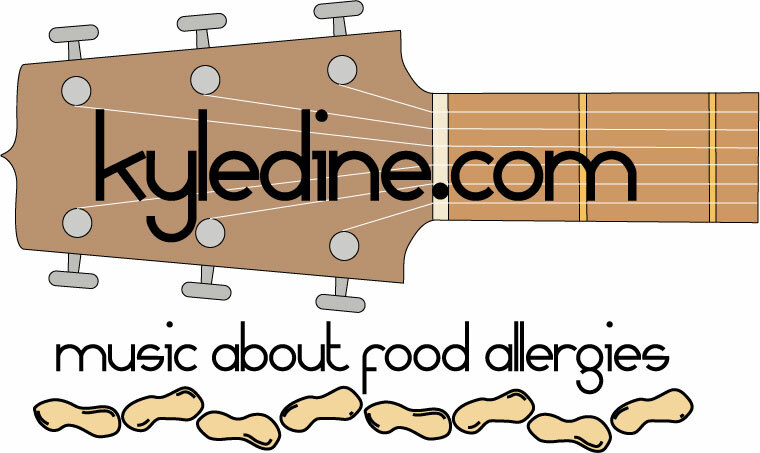 To grow the reach of allergy awareness – Although I will be raising awareness for their product/service, they will also help raise awareness about my music and performances – which ultimately will lead to more opportunities to educate others. To let the allergy community know about products/services I support – I am not promoting random things like aluminum foil 🙂 I would also never promote a product/service that I don’t believe would help the allergy community. Please view my sponsors as companies/organizations that have my stamp of approval! To invest in what I do – I try to keep my speaking fees as low as possible to prevent the cost of my shows from being a barrier to schools. The additional money I receive from sponsorship will go directly back into my show in the form of new equipment/props and assist with the development of an educational resource binder that I will leave behind at every school to help keep the message going long after my visit. So does this mean I’m going to perform with logos tattooed all over my body!? I am very excited to share more info about all of my tour sponsors with you soon! I have spoken to all of them and know first hand they are all as passionate about raising food allergy awareness as I am. I am grateful that they are “all aboard” the tour and that they support my passion to educate children about allergies. I would like to personally thank Jodie Hommer from Team Anaphylaxis, and Lisa Horne from the Arizona Food Allergy Alliance for their help in showing this newbie the ropes of sponsorship. I appreciate your understanding and hope to see you on tour! PS – Please check out my sponsorship package to see all of the cool ways sponsors will be integrated into my tour. Allergy Aware Companies – Join the Tour! I am excited to announce that this will be the first time that I am bringing sponsors on board. As I travel across the country I want to help others learn about allergy aware companies that I believe in. There are so many companies that are providing amazing products, services and resources that it can almost be overwhelming to know what’s what. I hope by aligning with certain companies that my fans can learn more about companies that may make their lives easier. I have been in direct contact with companies that I would like on board and so far I’ve had a really positive response! Proceeds will help me revamp my show as well as assist with costs of putting together a food allergy resource binder. My goal is to give all of the schools I perform at worksheets and resources that will keep allergy education going long after my performance. The one deliverable I’m most excited about is to write a jingle for Guitar level sponsors. Jingles are one of my favourite types of songs to write! I am a jingle junkie and have a little TOO much appreciation for all of the old gum jingles – “Big Red” being my all time favourite!